This deserved its own post. 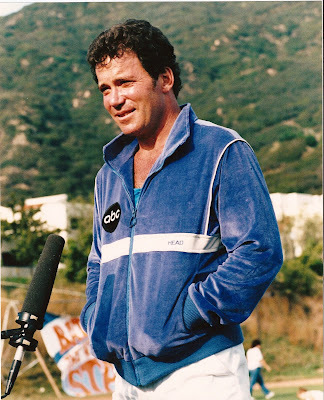 Is it Kirk at the Starfleet picnic? I didn't make this video. But I have this ornament now! SF Chronicle Travel - Trek crew featured! Space Cruiser on the playground! What sports does Kirk like? Jim, get out of the goddamn chair! Hopefully, this will inspire all of you with your Christmas Homework Essay Question: WHAT WOULD A CHRISTMAS EPISODE HAVE BEEN LIKE? Warp Speed - Star Trek improv at Fort Mason in San Francisco! SO FUNNY! 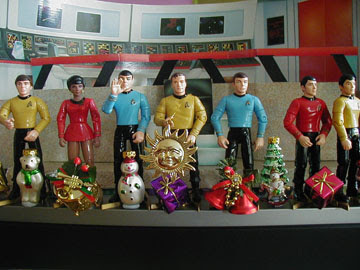 Homework: What would be in a Star Trek Christmas episode? Including in the movie Fanboys. This could be funny! 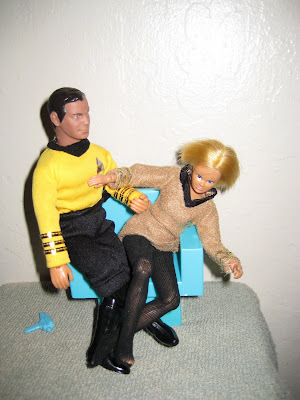 And they're right; Picard isn't gay, Riker is. 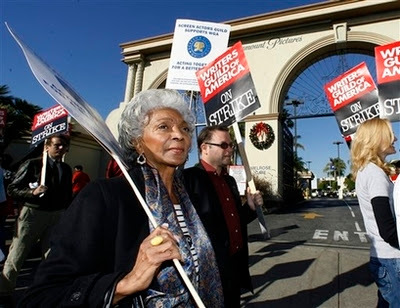 Here's Nichelle Nichols (looking fabulous as always) supporting the WGA on the picket lines at Paramount. 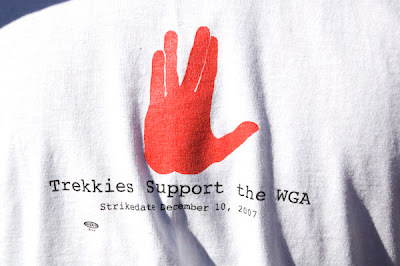 Yesterday was a Trek day, and lots of folks showed up: Walter Koenig, Brent Spiner, Scott Bakula, George Takei, Wil Wheaton, and of course Harlan Ellison (who's been very active on the lines since the strike started). Pop over to LAist to see more pics from the front lines. Grabbed from the ever-lovin' Mike Sterling. 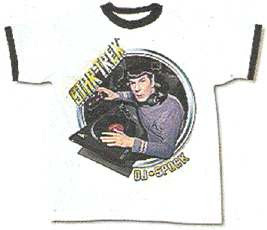 Now, let's clear something up: Mike says, "It's cute seeing companies still trying to make Star Trek "cool." Not working, sorry." 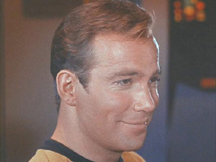 HEY: Star Trek - the original series, anyway - IS ALWAYS COOL. Cheryl's pictures from Murphy's Bar!